I’m guessing some of you found Lawful Rebellion through looking for new ways of challenging the crooked Penalty Charge Notices (PCNs)? Well this article is all about the background of PCNs and our ideas on the best ways to respond to them. 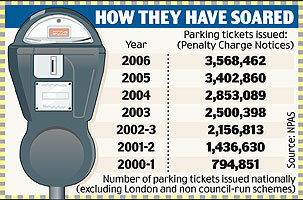 Before I knew about the PCN deception, I challenged every single parking ticket I ever received on their turf. From memory, my record was pretty good in overturning the tickets. Once I even got the Mayor of Hackney involved regarding my car being unfairly clamped in a place with single yellows and several blank posts back in 2006. Hackney Council completely ignored my letters for a refund for over nine months, which I’m sure isn’t uncommon. The most expensive parking nightmare I’ve witnessed was in the Private, when my car was towed away from a Petrol Station car park and I ended up paying £300 for my car to be released! If I knew then, what I know now, they would have been the ones paying me if they didn’t give me my car back. Just a note, private ‘fines’ are not valid, as they are not ‘enforceable’. If they take your car away, you can go through a regular Statutory Declaration process citing Section 2 of the Bill of Rights 1689. Are the DVLA and Councils in collusion to rip us off? Be under no illusion, the DVLA has everyone who registers over a proverbial barrel because it is us who literally beg for their care. And it’s registration that the Councils use to send Notices, which to most humans is scary big brother stuff. Now this cooperation of registration is being abused through profiteering schemes like people paying to find out about the details of other peoples cars and for the right price, giving 3rd parties access to peoples’ registration information for the marketing of Castrol Oil on billboards. If the DVLA and Councils are making £328 million (raised in 2008-9) from old rope, surely the people who supplied the rope should see an annual windfall? PCNs rely on people having registered with the DVLA and becoming the Registered Keeper, note: NOT the registered/legal owner. By the fact the DVLA can take peoples’ cars to be crushed, illustrates that those who are registered aren’t the real owners’. If any of us were the actual owners, the DVLA would be committing a Common Law crime of Theft. Some argue that the DVLA only own the registration number of peoples’ vehicles, not the actual vehicle itself. But by process, people attach the registration to their vehicles and accept they’ll use the vehicle within the confines of registration. The assumption is made that a vehicle in the database is fair game for the DVLA, as it’s in their care, just like an NHS Doctor is in the care of its patients – all in all, very disturbing realities. All I can say is that nobody to our knowledge has made neither heads nor tails of the secretive process of the V5 document, only assumptions based on reactions and knowledge of Commercial Law. What I am sure of is that through action & successfully using the various Notice methods, various administrations go into spasm and no Council has yet possessed the legal resources to dedicate to what is a clear grey area, your rights as a human being and the various legal personalities they extort money from. A reasonable argument for controlled parking is that people need to park on their own streets and parking restrictions are logical for safety purposes. There are many ways to achieve safety and fairness without treating people like children. None of us really have any idea where the transfer of money ends up, though we did have a little glimpse this year of where some of the money goes when we found out the Councils are lining their pockets in Tax Havens such as Iceland. The reason Lawful Rebellion exists is to protect our families, communities and the world against the de-facto corporate governance that’s plaguing our lives and taking away our confidence in governing ourselves. As you may have already seen, we’ve started our Toolbox and Lawful Rebellion Guide series’, which have already had amazing results for people. For instance, recently Deadbeat Dads have reported using a variation of our Affidavit that a case has been dropped already. We also know that the same Affidavits have turned away debt collection agencies, bailiffs and councils, and it’s the same with PCNs too. We acknowledge people have found various ways in fighting PCNs. I for one have helped people out of many PCNs by writing that they’re not the legal owners; and others have successfully used the Freeman technique of clarification that the Person exists. Retrospectively, we reckon there are only two ways to skin these authoritarian swine’s – by saying ‘no contract return to sender’ and/or serving Affidavits. If you’re not ready or have hesitations in asserting yourself with the Authorities, then don’t – wait until you’re ready as fear could get the better of you. Whilst I write these words I wonder how it’s possible to feel spiritual in discussing PCNs! But quintessentially, Lawful Rebellion is about overcoming the fear of people who think they have power over us all. Some argue that this Bill doesn’t stand up well in the Court because there is new legislation that overrides parts of it. But regardless of this issue, Nick Henderson asserts he hasn’t committed a crime, so there is no place for him in Court to be convicted of any wrongdoing. There is damning audio evidence from a meeting between Nick and Ian Anderson, Head of Scarborough Council Legal Services, with Mr Anderson admitting PCNs are not fines but merely contracts. This information, if you’re bold enough can stop any PCN that unfairly comes your way. There are several ways people administer saying NO and here are a few ideas to start you off. The first I believe John Harris has popularised – slapping a sticker on the sender’s envelope saying, ‘No contract, return to sender’ and posting it off; secondly, you could write the offending Council a letter stating that you will not contract with them; and thirdly, you can put them on Notice, asking for proof that the PCN is not a contract. They will try again and again to force you to agree to their terms, which are for instance highlighted in John Harris’s Tax Demand case. They’ll do this by sending many letters and then pass the claim to a Debt Collector, which will end up totalling over £350, if it’s a PCN. This method if not managed properly will certainly end up in an unpredictable situation because of the fear factor. You need to always be realistic with how far you’re willing to go, how much time you have and whether or not you care about your possessions. What will also compound fear in peoples’ minds is the new London Authority’s self-appointed ‘power’ to take your car away after you have three overdue PCNs under the London Local Authorities and Transport for London Act 2008 starting soon. If there’s no foundation to the PCN, there’s certainly no foundation in towing your car away. After reading through the Act, there are some interesting measures and a lot of contradictions, which can only be for the famous trick of the Officers saying one thing and meaning another. Please download the PCN Affidavit pack here and read through all the docs especially the Notice before going any further. This method is as much about how you deal with it as how you have defined who you are. Matt swears by this Affidavit method and he said that nobody ever ends up on his front door when Authorities wrongfully intrude upon his business. Sceptics always ask me, ‘where’s the proof’, well the proof is when you do it and it works or you see a friend do it and it works. I suppose with anything new you have to try it for yourself and take a leap of faith. Whichever choice you make, you’ll notice that Lawful Rebellion could have already given you more choices than you thought you had before right? Matt can explain the PCN Affidavit process much better than I! OK, so let’s imagine that Mary Smith continues in her attempts to extort funds from you by ignoring your Notice, naughty little and deluded dishonourable Mary. But by doing this, she would be attempting to injure a real party, which is extortion (this is where the term ‘tort’ originates, as in tort claim meaning ‘torture’). You may want to continue by gaining a private agreement of the parties, which is private law that cannot be impaired by any other party. Step forward the PCN Affidavit that you should mentioned in your Notice to Mary. Download the sample documents from the previous Toolbox on Affidavits. Then use the Notice of Fault and Opportunity to Cure and the Notice of Default via the process as explained in the Affidavit article. But, you will have to make further alterations by making sure you replace the Notary verification section with two private witnesses on all the documents. Now if you live fairly close to the location where the Affidavit needs to be sent, there is another great way to save on the £4.95 x 3 concerning the registered mail cost for the whole process. Either post it by hand yourself and then make these alterations on the Notice of Fault and Opportunity to Cure, and Notice of Default, or get a 3rd party to post by hand and include a Proof of Mailing copy, which is in the PCN Affidavit pack. Again, keep the original of this Proof of Mailing as well as the originals of all your private documents. Remember as the Holder in Due Course of the originals, you can make true, correct and complete copies, as explained in the Affidavit article as mentioned above. This whole process demonstrates that you know that you are NOT liable for the alleged public debt/liability that is attributed to the PCN, as well as demonstrating that they have no claim whatsoever in this matter against you. You are a man or woman and therefore you are the Sponsors of the Credit and the true wealth and power in commerce. I challenged a pcn and gave them 28 days to respond or the notice would be considered cancelled. 40 days later thay sent me a notice to owner. traffic penalty tribunal receive 65p from councils for every pcn issued so they are not independant as they are in the pay of the councils. Many thanks for this: “advice” was the wrong word to ask for – my apologies. I am going ALL THE WAY with this – and may end up in jail – but I am prepared to do this – because we are right, and they are wrong. Re the AFV – am I right in thinking that if I sign this and include my NI number, then return it, this is a way of paying it from my Bond? the money? The friend claimed a remittance is a specie of money …. and therefore was deposit-able?? Also, could you say how I get leverage? Could you comment if I m on the right track, please? I was told a bit about this rebellion website by a customer I served in our local Booths the other day. But I just want to know what it is all about in a nutshell? All good stuff, but I suggest just keep it simple. A 2 sentence letter to the Council has worked for me. Just state that per the DVLA registration Document you are merely the keeper of the vehicle and if they wish to pursue the matter they will need to reissue the documents to the owner. Also DO NOT complete, sign and return the Council’s dispute form. This is a trap!! I read some where years ago that a debt could not be sold to a 3nd party. If a debt collector buys a debt, the debt was said to have been paid. The debt is between two parties, if a 3nd person pays that debt it is said to have been paid. It is English common law. Can anyone help me find more about this. Thank you. PS on the Bill of Rights, it says it is for ‘ALL TIME TO COME’ therefore no laws can be brought it against it. That is my view. They have not removed the oath in the bill of right for MP’s they just made a new oaths act. If an MP does not take the bill of rights oath in my view they should not be allowed to set as an MP. Hi Ian, remember there is only an alleged debt. When collection agencies ‘buy’ debt, really they are just getting some personal data and firing out a load of template collection letters to see how many fishes ‘bite’.. after a set period the non payers go back to the council for additional measures. Try this….. it’s very simple and works! Do I still have to pay my local PCN charge if it says that the Excise Licence No, was ‘Obscured’. I have made a representation to the local authority because I do not think it is correct, as with many here! Can I use the evidence that they don’t have information of when I parked but only at the time when the notice was served.? Can I do anything else at this stage since I’ve replied to them now? got a couple of London congestion pcn on my previous car. I contested against it with a reason that I didn’t know and I was driving into London for the first time. It went back and forth a few times but came back as i have to pay. do i need to still pay them or is there a way to not pay. Pls help as I’ve been unemployed for the past six months and I don’t have any spare change to pay these thieves. I am at the process of appealing a PCN. No evidence of when I parked, I have asked for condemning evidence that they can’t prove – what should I do to get the notice cancelled once and for all? I had a PCN from my local council which I’ve ignored as I’ve had no corrospondence that required my signature. If I don’t sign for it how can they prove I recieved it. I’ve continued to ignore everything, court, two lots of threatening bailiffs, but I’m starting to get a bit worried if they bother to turn up at my door. Have I done the right thing by not entering into ANY corrospondence with ANYONE? If they turn up at my door could they sieze my car with no evidence? I have received a PCN from he council addressed to the human and NOT the strawman. What do i do? i need some advice, i dropped my pregnant wife and child off on a bus lane not more than a few minutes, i got a fine as they got me on camera, which i did not pay, now they threatening me with a solicitors letter telling me they will take legal action and i will also need to pay there fees. what can i do, what is my next step of action? My pcn has not been delivered with my name in capitals but rather lower case, what now? It was my understanding this would have my name in capitals but the only capitals I see are at the beginning of each name. I’m not paying anyway, never do. I just blank the letters and the door and the phone. Never ever ‘Appeal’ appealing is an admission of guilt. I have refused to pay a PCN for waiting on a Birmingham Car Park and not aquiring a ticket. I was there for all of 15 Minutes (waiting for some one). I have contacted the vehicle control services and informed them i will not be paying the penalty charge. I have now received a letter from a debt collection agency informing me that i must pay £160.00 (original fine £70.00). What happens if i still refuse to pay? Should i contact the agency or just ignore the letter? is there any other way to stop this escalating further. Hi guys… going to keep this as brief as possible. It is only in the last couple of months I have been aware of lawful rebellion and the severity of the corrupt governments that control us and I intend to educate myself as much as possible though obviously as I’m sure your all aware there is an awful lot to learn! Back in April I received a PCN from Manchester council because I returned to my car 4 minutes after the paid for ticket expired. For a good few minutes before the ticket expired I was attempting to extend the ticket I had purchased by phone and using an iphone app put in place by Manchester city council however their systems failed me and I received the ticket. At this point I was not aware of lawful rebellion and the true nature of parking tickets etc. For this reason I appealed the notice, in writing, obviously unknowingly admitting to being the legal personality of myself. The appeal was refused and they say I am still liable. Because I have already written into the council, acknowledging the PCN and admitting responsibility for it, is it too late to refuse to pay the ticket using the lawful rebellion process detailed on this website? Additionally, my car is registered to my sister’s private Company as the registered keeper for insurance purposes – does this complicate the matter in anyway? I did actually decide to pay the fine on this occasion purely to reduce the hassle involved, however when I have finally managed to get on the council’s website at a time when it was working properly, the PCN has now risen from £25 to £75 which makes me more inclined to do whatever I can to refuse it. I am wondering – whether or not I should continue to appeal the fine in the usual way, pleading my case as I did in the original appeal back in May, or whether I should take the approach of the lawful rebellion to dispute the charge. PS. if there is another forum or area of the website where this question would be more suitably placed, please advise so that I can re-post. Please see my previous post regarding the PCN received in April which I am still fighting. As mentioned, the registered keeper of my vehicle is my sister’s Company, for insurance purposes. I am wondering if my sister’s company is classed as a public entity? I am presuming not, and that it is in fact classed as a private entity? Therefore as powerful as a man or woman in terms of an affidavit? I have sent the NOTICE to cease attempts to collect funds, addressed from myself. Manchester City Council have then sent a further PCN to my sister directly, stating “as she is the Director of ….. Company” she is liable. I have then sent a further notice addressed from my sister and signed by her (Name of the family name etc). We have now received an intention of court action, addressed to my sister’s business name – and am now unsure where I stand with this? I am currently preparing an affidavit (for the first time) using this website and the toolbox… and need to ensure I do this correctly. I would be grateful if anybody who has the knowledge/experience of this could advise me how this works? Anyway thanks for reading and thanks in advance for any responses.. much appreciated! PS. Following my previous post I did receive an email from somebody answering the questions (unfortunately I now cannot find the email), so if your reading this, thanks for taking the time to respond! Paul Fox’a comments were the most sensible. Check your Registration document. Nowhere would it say you’re the owner – its says you’re the keeper. The PCN notice they make it clear the “Owner” is liable. I never pay for any parking tickets. After approx. 3 month of issue of any PCN, you will receive a letter from Northampton Court. Just fill & return the FORM TE9, tick the box NO NOTIFICATION RECEIVED. Wait a few weeks. Magic happens. PCN revoked everytime. Thank you. At times some of our greatest discoveries occurs from situations of distress, adversity, and a multiplicity of other reasons; and I must offer my profound thanks and irrefutable respect for those responsible for this legal engineering tool, which provides hope and remedies against the tyranny of the PCN system; a bankrupt, decadent and unlawful law. 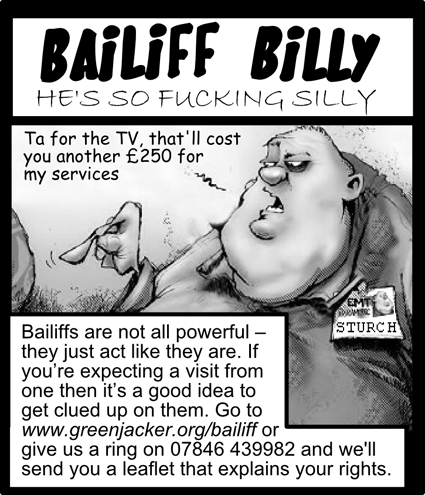 I’m currently being threatened by 2 different bailiffs for non-payment of 2 PCNs with each bailiff demanding £500, or they’ll enter my property and seize my goods. I also have another 5 PCNs from a Local Authority which are unpaid and I fear that they’ll resort to using bailiffs if they don’t receive settlement. There are mitigating circumstances, which I think could help my case. Please advise me on the best course of action to take as the situation is having a damaging effect on my health. Hi I’m looking for abit of advise, I parked in a car park at work it’s a private one but not owned by our company it’s all private land with LDK security group and I just have to have a badge in my car. One day after work I had got a parking charge notice which I was quite shocked to see my ticket was on the floor and not on display. A lot of people at work said Iv had one and Iv never paid it you don’t have to pay just ignore it. Iv ignore it and now 2 months after Iv got a letter in the post from parking collection services saying my bill had gone up and that they got my details from the DVLA and if I don’t pay it they may pass it over to a debt recovery company. Again people at work have said Iv had two letters and nothing has come from it but I’m just wanting some advise on if they can legally enforce it or take me to court ? Hi Everyone, i hope you are all well and keeping up the peaceful fight for freedom and justice. If anyone could help me i would truly appreciate it. I was parked in a taxi bay outside the local banks, there were no cars around it was pretty quite so i parked there for no more than 7 minutes. I clearly had my parking noticed displayed however the ticket issuer still gave me a ticket and placed it right next to my notice. what do i do now about this? do i just pay the fine or do i still challenge it? I am not doing this to piss people off nor am i doing this to not pay as i have been paying all my life and way over the top. Now i am fully awake and as there is nothing i can seem to do about geoengineering and believe me i am shouting about this issue, ( if you are unaware of this issue then please look it up, and go out side and keep looking up, i am sure you will notice) so i am going to fight for what is right. So any help or advice anyone can give me would be greatly appreciated. i was parked in Allum Rock Road in Birmingham and upon my return i had a PCN stuck on my windscreen. It was Saturday afternoon 2.10 pm . I am from Scotland and do i still have to pay the ticket to the Council at Birmingham. I had a look further up the street and seen a sign that no loading anytime between 1-7pm. However, i never seen this sign and my car had broken down there. I was away to get jump leads and eventually someone gave me a jump start and thereafter i was able to drive away. How can i contest this PCN? Can someone please advise me as i do not want to have any issues and if i don’t pay then i understand the law is different is England and gets passed onto bailiffs as we do not have them in Scotland. I am not willing to pay the PCN as i had broken down. I am in London, and I recently received a letter in the post saying I never paid a PCN from February. I was not the driver at this time but i am the keeper. I sent an online appeal explaining that I did not know the vehicle had been moved and was not aware of the PCN and was not the driver as I was at work at the time which I can prove. I ticked the box on the online form saying i was the keeper. They sent a rejection letter back saying that the charge is payable by the owner of the vehicle outlined in the Traffic management Act 2004. therefore the registered keeper remains liable, whether or not they were driving the car when the PCN was issued. What is the best way of going about this? Could i technically say based on their act the DVLA is the owner and I am just a keeper, or is there a better way of going around this? it wasn’t explained that the PPI address could stop ahead of the loan or credit was repaid. generally called claim handlers, statements companies or claims management companies (CMCs). consider whether to pay for an upfront fee before your problem is posted, as there’s no promise it’ll become successful and you will be left-out of pocket. you get a £5,000 refund you would need to pay £1,500 of it to a state handler. Should you claim yourself, you’ll get all of any refund you’re eligible to. clear about why you believe the policy was mis sold. The firm or bank has eight weeks to answer, suggesting whether your complaint has been successful or why it requires additional time to appear into it. contact the Financial Services Compensation System (FSCS) to learn making a state. a final response from your company, or perhaps the FOS may not be ready to deal with your complaint. I had received a parking ticket in Coventry back in Jan’15, which I challenged further within 10 days. I did not hear from the council for over 6 months, and I assumed the matter was closed. However, yesterday I received a letter again – claiming that my challenge was rejected. Now this was about 6.5 months later. Now my question is, can council respond to my informal appeal after 6.5 months? Are they not bound to issue NTO within 6 months after PCN was issued? i have had great success in not paying PCN, however I have now received a “moving traffic penalty charge”, my satnav said turn right, I did, but it was not allowed. anyone know if I should treat this the same as a normal PCN? Write this to which ever council and tribunal or court and stick to your guns and don’t back down,….. These are the points in law we want judicial review to look at as my husband had no joy with Traffic Tribunal. Point 1) European Convention of Human Right issues relating to article 6 right to a fair trial as their is conflict of interest with tribunals and council because each traffic tribunal are paid 65p for each case by every council authority in U.K. article 8 right to respect for private and family life which shows interference by local authority with this PCN and article 13 right to effective remedy. states clause 8.79 “ the primary objective of any camera enforcement system is to ensure the safe and efficient operation of the road network by deterring motorists from breaking road traffic restrictions and detecting those that do. To do this , the system needs to be well publicised and indicated with lawful traffic signs”. be an appropriate size depending on context, for example, whether they are viewed by pedestrians or car drivers.”so therefore I want ticket cancelled because CCTV signage are not displayed on Carlton Street. Under the Unfair Terms in Consumer Contracts Regulation 1999 Schedule 2 there is ambiguity in the terms and conditions regarding PCN accordingTraffic Signs Regulations and General Directions 2002. I also like to mention if you see the PCN document it is not signed by Xxxxxxx as authority need a binding signed agreement for a contract to exist according to Contract Law. Under duress there cannot be no contract and we have responded accordingly in disputing this matter. decision commonly referred to as the “Metric Martyrs” Judgment. may view the judgment’s relevant sections 62 and 63). constitutional rights. Examples are the . . . Bill of Rights 1689 . This was upheld by Lords Bingham, Scott and Steyn in an appeal which went to the House of Lords on Monday 15 July 2002.
incorporating unlawful policies? My husband did mention common law but never had a chance to mention Bill of Rights because the tribunal judge were in a hurry to go as video evidence proves. Point 4) the fine was £30 and it has gone up to £60 this is once again unfair due to the unfair contracts term act 1977 s11 (reasonable test) and the unfair terms in consumer contracts regulation 1999 schedule 2 which mentions ambiguity in the terms and conditions of the contract. As My husband appealed accordingly and within timescale so why has the fine exceeded? Why is this contract being forced on me? We do not believe nottingham council incurred loss of £30 or £60 so why are they charging excessive amount? We also question the validity which is mentioned in point 2. Refer back to Bill of Rights 1689 in point 3 of supporting document. Point 5) My husband xxxxx xxxxx also told the tribunal that he believes he was travelling in the car when this contravention took place but it was not taken into consideration as it is still on my name. I also like to mention according PCN pictures there is no obstruction caused to buses, cyclist or pedestrians. refer back to Bill of Rights 1689 point 3 of supporting document and the unfair contracts legislation. Point 6) We also draw your attention to The Administration of Justice Act 1970. (d) utters a document falsely represented by him to have some official character or purporting to have some official character which he knows it has not. (2) of the enforcement of any liability by legal process. It is also provided that a person may be guilty of an offence under paragraph (a) above if he concerts with others in the taking of such action as is described in that paragraph, notwithstanding that his own course of conduct does not by itself amount to harassment. What gives Nottingham City Council and Traffic Tribunal the right under Common Law to demand money from me using what could be viewed as a threatening letters/decisions? Point 7) I xxxxx will also be filling in a fee remission form as I cannot afford to pay the amount for court costs which I apologise sincerely but in due course I want Nottingham City Council to be liable for these cost incurred for this case because of there incompetency as it is only fair because they have made me go through this unlawful process. Point 8) Hope these matters are looked at thoroughly otherwise I have no choice but to pursue to next stage of court hierarchy as I am aware of other cases relating to PCN where Judicial Review have decided against Bill of Rights 1689 which is wrong in law. The higher courts have acknowledged this matter in “Metric Martyrs” judgement where a precedent has been set by Lord Justice Laws mentioned in point 3. I sincerely hope we have a honest and sincere judgement as Judicial Review is set up to protect public interest. Point 9) Finally In regards to all my issues I want some kind of remedy for administration cost and personal time of nearly 3 months dealing with this case. I also want immediate cancellation of this unlawful PCN as it is illegal and void according to our constitutional law, Bill of Rights 1689 which supercede any ordinary statutes including the ordinary statutes I have mentioned. Some very interesting research you have presented here – thank you Peter. is it legal for the DVLA to give my details to a third party as this is or is not against data protection laws ? From a previous post: ‘…the severity of the corrupt governments that control us and I intend to educate myself as much as possible…’. Ok, this doesn’t relate to PCN’s at all whatsoever so please excuse the posting, however in relation to the above quote – I think that over the past few years now, only those who are permanently asleep do not know that our politicians that we vote for in the hope that they’ll be a tad less evil than their predecessor, are basically self-serving, untrustworthy nasties – just look at the expenses scandals which are still continuing after all that huge media furore! And god knows how many other events involving politicians at both local and Westminster level. Well, back in early 2011 I was told that these cretins are helping their paymasters in the global business world to PRIVATISE our National Health Service! I don’t mean just to the non visible extent to which this has already occurred under blair, Brown etc – I mean from 2010 onwards the NHS marketisation strategy is the biggest single goal of their entire ’20/20′ plan, even bigger than fracking! You see, politicians are the tools used by the City of London, The Freemasons and the Bilderberg Group (http://www.globalresearch.ca/the-true-story-of-the-bilderberg-group-and-what-they-may-be-planning-now/13808) to PRIVATISE our NHS – OUR NHS, not theirs! Whilst some folk in the UK have absolutely no understanding whatsoever of what PRIVATISATION is about, others assume that the day-to-day running wil be placed into private finance and staff outsourced into the private sector (with all the associated mess that brings!) but “I’ll still be treated at the doctors, the hospital just the same…” (note the “ME”…., “I”…). WRONG! The game plan is to take the UK down the American route – that is for us all to have PRIVATE HEALTH INSURANCE. This is the time for you to see Michael Moore’s ‘SICKO’ film! “Oh but the NHS is in a right state isn’t it, what with no money, all these foreigners grabbing the services, foul-ups….”. BECAUSE THE GOVERNMENT HAS USED MAINSTREAM MEDIA TO MAKE YOU THINK ALL THAT FOR YEARS!!!!! There has always been issue. There always will be. Its is still a TAXATION-BASED (free at the point of use/delivery) system that MP Nye Bevan started in 1948 – a time when the UK was 10x further into the red than we were in 2010 (“there is no money..”). When we are forced to buy into PRIVATE HEALTH INSURANCE, will they lessen the tax we pay? NO! UK public – read up on this and bloody well stop them doing it! There are many websites as well as the one above. The NHS will NEVER be bought back once it been totally destroyed so do NOT sit on your arses and moan, the way British people love to (esp when reading the Sun!). Parliament cannot hear you moaning from your pub, cafe etc! “That’s the standard technique of privatization: defund, make sure things don’t work, people get angry, you hand it over to private capital.” Sound familiar – all that daily “NHS is faulty..” talk in mainstream media, esp the BBC? AND WATCH THIS FILM: ‘SELL OFF’ – The ABOLITION of YOUR NHS. Happy reading. One last point: Don’t get mad – get even! Happy reading. One last point: get mad – AND get even! I can’t open any of the links to the affridavit pack on either a windows pc, or an Imac, is the link broken? can someone repost\ or send me the information. Hi All. Do you have any up to date information please? I love reading your site and it helped me immensely when I received a PCN in 2014. Thank you. hello. is your website still up and running ? if yes is it possible to phone you to get advice regarding a pcn ? Hi guys, i received a parking ticket from 2013 now in 2016 because i parked i a private car park for 20 minutes, it as only arrived today but the letter is not signed by anyone and apparently i have heard that they must ask you for the drivers details but they have not. Is this reason enough to void the ticket and is there anything i can do after all this time? For all those who are unaware… DON’T PAY PCN’s… put them in the bin…. step 1. when you get the PCN’s – don’t panic or stress and keep your money – don’t pay it. step 2. when they write to you – Notice to Owner (28 days after the ticket is issued)- put this in the bin too. step. Northampton County Court (not a real court, just a bulking centre that deals with traffic enforcement issue) will write to you. just tick the box that say you didn’t receive the ticket – end of story. All of this process will take about 3 months so be patient. Don’t panic. Remember, you are under no legal obligation to acknowledge these. 1 after 3 tickets they can take your car. this is crap. If they do – call the police and tell them that the car you “keep” has been stolen. THERE IS NO DATABASE IN THE UK THAT PROVES OWNERSHIP. Look at your V5 log book. at the top is states “THIS IS NOT PROOF OF OWNERSHIP. IT SHOWS WHO IS RESPONSIBLE FOR REGISTERING, TAXING AND KEEPING THE VEHICLE. 3. As the “registered keeper” you can say that the owner is someone else and you don’t have to prove this. Its up to them to prove this (which they can’t). So… you tell them the police that the car you “keep” for the “owner” has been stolen. The police will ensure that the car is returned to you, then the police will tell the council that they can’t take property on the assumption that it belongs to the “registered keeper” without proof that the “registered keeper” and the owner are the same person. I have an awkward one, I had a vehicle which was not in use, it was parked on a garage forecourt, The garage owner moved, he used my van to transfer tyres, when he dropped it back, he placed the van in a side street that is very rarely used, off the beaten track, as the vehicle was sorn I had to move it, when i tried it wouldnt start as through investigating the problem the garage broke the chip inside the key, the owner said the engineer was going to come and fix it, after a week still no sign, the vehicle was removed without warning, no ticket or clamp. It was taken approximately 9pm. That even checked my post nothing, the next day I tried to find out who took it and where to, I found the vehicle in a pound 30 miles away, I asked them why and who took it, had no decent reply other than the fact he said “there is a daily charge and if you dont pick it up after 7 days we will take legal ownership either crush it or sell it” I was not happy., I told the pound that I fully intend to get my vehicle back and you have no right in taking ownership. Next day I had there letter which I filled out the relevant form to say I want my vehicle. I appealed all the relevant charges which has gone on for a 6 months plus, I aslo explained in all my letters I want my vehicle back. I can only repeat what you have previously been told. The enforcement action taken against the vehicle was correct as the vehicle was on a road untaxed on 15 febuary 2016. The dvla wrote to the keeper of the vehicle to advise that the vehicle would be disposed of unless claimed from the vehicle pound (which I have stated so many F***g times to the bunch of idiots). No reply was received and the vehicle was disposed of. (disposed!!! My arse they bloody sold it !!!! In all circumstances dvla’s position remains the same as previously explained to you. if you wish to take this matter further that will be a matter for you to decide how to proceed next. I have not replied to this as yet, as I was going to seek legal advice, after reading all the comments, can I phone the police and explain to them that the dvla have stolen my vehicle? I am so frustrated I won my case as, the garage wrote a letter to explain the situation as the vehicle couldn’t be moved, A I had no where to put it, and B I couldn’t afford to move it, The garage owner went bust so he was skint. For me its not about the money, its about the principle, they cant just do what they want and get away it !! I wont let it, even if I have to take them to court I WILL. I AM NOT GOING TO LET THESE IDIOTS GET AWAY WITH THIS, I WILL FIGHT TO THE DAY I END UP IN MY GRAVE! any help on this I would really appreciate any ones help.